Yorkshire One is beckoning for Old Crossleyans after a damaging 22-20 home defeat by a youthful, competent Pocklington side yesterday. 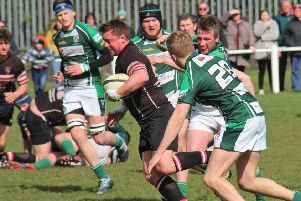 The Broomfield men, seeking a fifth successive home win, were undone by two tries in six minutes from the visitors entering the closing stages. A 13-10 advantage quickly became a 22-13 deficit and although a spirited Crocs side salvaged a losing bonus point with a converted try, they were left to rue the three that got away. A Driffield win aside, other results for once went Crocs way. However, they remain next to bottom of North One East, seven points behind Bradford & Bingley and Alnwick with three teams expected to fall through the trap door. They have seven matches left, five of them against teams in the top six. Four of the games are away and when you consider that Crocs haven’t won on the road all season, you get some idea of the task they face. On a near-perfect winter’s afternoon for sport. the running and passing rugby was in contrast to the up-the-jumper fare served up on Calderdale’s other pitches in ankle-deep mud in previous weeks. Crocs, with a revamped back row which included player-coach Neil Spence at No 8, started brightly and were rewarded with a Chris Vine penalty after seven minutes. Pocklington stand off Dan Elliot made it 3-3 when home centre Neil Richardson was offside. Crocs were forced to live dangerously for a while. A foot in touch denied Pocklington winger Tim Nixon a try in the left-hand corner and home fullback Ben Greaves was bailed out by fine Crocs defence after his wild pass had handed over possession in a dangerous position. Spence was serving Crocs well at the breakdown but the home lineout was again struggling. Crocs regained the lead on 29 minutes following a solid scrum just inside the Pocklington half. Winger Adam Sutcliffe was cleverly brought into play and put the defence on the back foot. Stand off Gareth Ott then produced a trademark side-stepping run to leave the fullback flat-footed and score at the side of the posts, Vine’s conversion making it 10-3. The visitors mounted strong pressure on the back of a kick from a scrum which took a wicked bounce. It took some good play to unlock a determined defence, a bout of quick, close passing enabling centre Billy Hardy to score the first of his two tries. Elliot’s easy conversion made it 10-10 and the visiting marksman missed a good chance to give his side the lead with a penalty at the end of the half. A Jack Hammond break prompted a long spell of Crocs pressure at the start of the second period. Pocklington cleared their lines but the hosts returned through lock Luke Gardiner’s fine run near the bottom touchline. Sutcliffe went close and Crocs, having turned down a couple of chances for penalty points earlier, this time opted for three from Vine’s boot. They held the 13-10 lead until the 67-minute mark when the powerful Hardy broke the line 15 metres out for an unconverted score. Pocklington’s next try was a real hammer blow for the hosts. Elliot made a weaving break down the middle and supporting back rower Rich Skowronek just managed to ground the ball as he was tackled on the try line. Elliot’s conversion opened a nine-point gap but home heads didn’t drop and, after a flare-up near the bottom touchline, adventurous play from Crocs resulted in Vine sending Greaves diving over close to the posts. Vine quickly added the conversion but when Crocs were unable to get the ball away from the next ruck the final whistle was sounded.